It’s a month into 2019 and the odds are good you are shaky on your New Year’s resolutions — if you have not shirked them altogether. Here is why New Year’s resolutions fail and a strategy to ensure that they stick. The most common resolutions I encounter from others are about weight loss, exercise and smoking. When I spoke at a top producers’ insurance conference, the attendees had an opportunity to share their goals. I expected to hear them promise to focus on areas of improving their practices. What did I hear instead? “How much, specifically?” I asked. He gave another vague response: “I’ll eat less and exercise more. What does he mean by “work out?” I checked for reality. “How many times did you exercise last week?” I asked. The most common response I get back is “zero.” “How about the week before that?” Again, another zero, and before that zero, etc. This person is making an unrealistic commitment and has just about a zero chance of succeeding. You can almost guarantee that there will be circumstances, obstacles, unscheduled priorities and interruptions that all get in the way, preventing people from doing what they said they would do. But there is hope. So, let’s say that they agree to a minimum-level commitment of working out two days this week. They’d like to work out four times but are only committing to and being held accountable to two. They can go ahead and reset their baseline by working out four or five times and then commit higher next week but they only have the behavioral credibility to commit to the lower level of two times. Now this brings up another key component for successful New Year’s resolutions — take small, realistic steps. There must be an intervention to compensate for human nature. We are all genetically coded to avoid the highest level of perceived pain and seek comfort. We are genetically coded to see threats, to be negative. We are not coded to look in a meadow and appreciate the beauty. We are coded instead to look in a meadow and see the lion that is barely visible. We are coded for survival. Because we faced a scarcity of food as cavemen, we are coded to binge, to eat well beyond our nutritional needs and to store the excess as fat. This is not appropriate for us today, but we still have the primal instinct. In fact, all of our evolutionary instincts are to recognize what can hurt us and to compel avoidance. This is based on this no-longer-appropriate human survival instinct. For example, the flight or fight mechanism will save your life if you see a bear. The problem is when these protective instincts occur regardless of the truth and validity of the threat. For example, you are driving and someone cuts you off in traffic. You get the exact fight or flight response physiologically but it’s not a true threat. You are sitting in your car. Your life is not being threatened but you respond as if it were. The key is to recognize that human nature is the real competitor to your reaching your goals. You are genetically coded to recognize the highest level of pain and avoid it for comfort. You are an avoidance machine! Once you recognize this, you can work with it, rather than fighting it. Here’s what this means for your commitment to exercise two times this week. You make the commitment, exercise two times. And you’re specific about what exercise means. So this is specific. It’s also a short-term commitment — the next seven days — and it is a small step with specific actions. And it’s realistic. So why won’t you do it consistently? Because this is only half of a commitment. You haven’t acknowledged the other reason for failure, which is recognizing your true competition — human nature — and having an intervention. It’s called behavioral contracting. 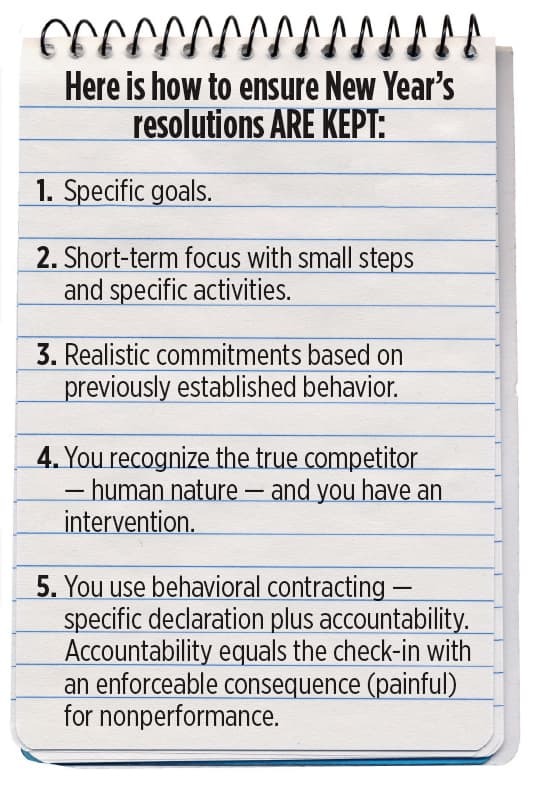 Behavioral contracting is making a specific declaration (such as exercise twice weekly) plus accountability. Accountability has two parts. The first part is the check-in. Someone outside of yourself checks in with you and verifies that you did what you said you would do. The second part is the consequence for nonperformance. There must be a painful consequence if you don’t do what you said you would do. This consequence must be more painful than the pain of the activity. Now you are tapping into human nature’s genetic coding of avoiding the highest level of perceived pain for the comfort. If the highest level of pain is the consequence, then you will be compelled to avoid. How do you avoid? By doing the activity you said you would do. Try it yourself. If you gave yourself a $1,000 fine if you didn’t do the activity you committed to do, I promise you that the pain of losing the $1,000 would far outweigh the perceived pain of performing that activity. The bottom line, you will still be an avoidance machine, but you will avoid the penalty by doing the action. Try this with just one New Year’s resolution for one week at a time and you will be happy with the result. Bob Davies of High Performance Training holds a master's of education degree in psychology from Springfield College and a bachelor's degree in health from Rutgers University. Contact him at [email protected] .